My son and I were on a walk the other day and he was noticing all the pumpkins people had on their front steps. He is only able to count to 2 and therefore every house had 2 pumpkins even though some houses had six! He was having so much fun pointing out the pumpkins that I thought the Three Ghost Friends would probably like to do it too. 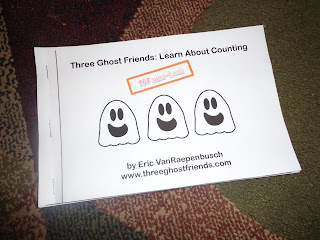 Three Ghost Friends: Learn About Counting - TGF Mini-Book can be downloaded, printed, and read with your little one RIGHT NOW! Just click here! (Well...you do have to cut the pages in half, make sure the pages are in order, and staple the book together -- but that will take less than a minute!). The mini-book may be of interest to teachers that teach guided reading. I had my wife, a first grade teacher, level the book and it came in as a Guided Reading Level D.
I hope your children enjoy counting right along with the Three Ghost Friends. ----> And I must also give you an activity that extends the mini-book too. 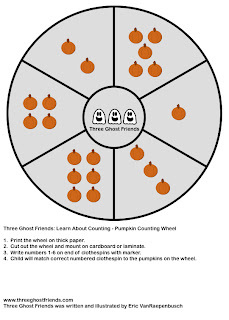 Here is a link to download a FREE Three Ghost Friends Counting Wheel! Both the mini-book and counting wheel are available on my Teachers Pay Teachers Page too!